If you’ve been reading this blog for a while, you already know that we are a family of avid readers and between all of us we read at least a hundred books each week. In my experience a quality Book Study Guide can make a huge difference in how we learn, retain material, memorize new words, and define novel concepts. 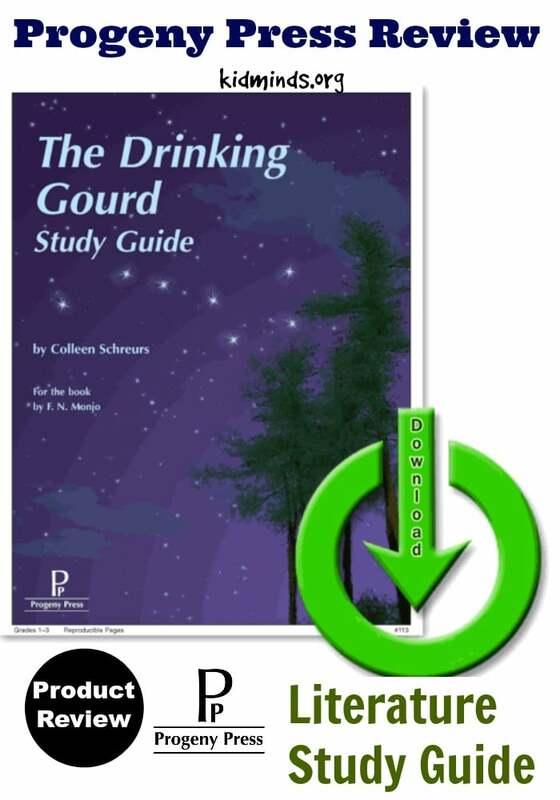 That’s why I was so excited to be asked to review The Drinking Gourd E-Guide from Progeny Press for the Schoolhouse Review Crew. Progeny Press is a small, family owned company. They create Study Guides for Lower Elementary, Upper Elementary, Middle School and High School. Guides can be purchased as printed workbooks, CDs with pdf E-books, or E-Guides (a downloadable pdf file). For review purposes, I was given a complimentary E-Guide for The Drinking Gourd by F. N. Monjo, which I downloaded to my computer as pdf and printed out. The Drinking Gourd is a captivating historical fiction set in New England in 1851. In the center of the story is a young boy Tommy, one of six children of the church’s deacon. Through his inquisitive nature and a talent for getting in trouble Tommy learns that his father is breaking a law by helping runaway slaves to get to Canada. Turned out that Tommy’s father is part of an Underground Railway system, which was put in place by an old sailor peg-leg Joe, who moved from plantation to plantation teaching slaves the words of The Drinking Gourd song. The song (our favorite song right now) was “a musical map.” A secret message in the song was directions for finding the way North by following the Drinking Gourd (i.e. Big Dipper). At the end Tommy helped his father by telling a lie to marshall. The book concludes with the discussion on the morality of breaking the law to save someone’s life. I poked around Progeny Press website a bit and noticed that there is some variation in format from guide to guide. I will tell you about our experience with 35-page long E-guide created for The Drinking Gourd. In my opinion, it is thorough and insightful. It is beautifully organized, but we felt free to shift things around for a better fit. For example, we moved Before-you-read activities to after we read the book. The length of the guide was not intimidating. We got through it in a few days. The guide encouraged my kids to think critically. Some of the questions were thought provoking and led to interesting discussions. The actual study part of the guide starts with a vocabulary section. I loved that vocabulary section was presented in a fun format. Copying definitions from the dictionary have never been the most effective way to learn new vocabulary. Here each vocabulary word is linked to the context. After vocabulary is a long section of comprehension questions divided by chapters. Some questions refers to the events in the book, other questions concentrate on how some characters feel and their motivations. We skipped a couple of questions because they referred to things totally unfamiliar to me and my kids. One of the parts that we all loved best in the guide is extension activities. We used the print out of the map (included in the guide) to mark the states mentioned in the book. We also used the print out of a night sky to find a Drinking Gourd (The Big Dipper). The guide also gave directions on how to make the Drinking Gourd Pumpkin (scoop out the pumpkin, poke holes for the constellation, then put a candle inside, but our local supermarket is not carrying pumpkins at the moment, so we will wait till Fall to try this one. The guide concludes with a comprehensive list of book suggestions of related interest and answer key. My children really enjoyed this book, so during the review period we read the book from the beginning to the end two times, plus my kids listened to the audio version of it a couple of times when they felt like it. We worked through the E-Guide together. We usually just took the book and the printed pages outside and studied in our backyard. We answered the questions, discussed what we read, marked the maps, and sometimes youtubed relevant things like the original song, about the book animations, and school performances of The Drinking Gourd. We absolutely loved this guide. It’s designed to be fun. My kids liked it. I liked it. The guide offered a substantial amount of information. We learned about the book and the author, answered comprehension questions, worked on scrambled words secret message, looked at suggestions for studying stars and constellations. We loved this E-Guide so much we will be definitely getting more E-guides for Lower Elementary grades. For the next one we are looking at either Frog and Toad Together, Keep the Lights Burning Abbie, Miss Rumphius, or The Long Way to a New Land. Besides Lower Elementary grade, Progeny Press also has E-Guides for Upper Elementary, Middle School and High School. Read other reviews to find out more about Progeny Press and their other products by clicking the image below. Hey Buddy!, I found this information for you: "The Drinking Gourd E-Guide from Progeny Press (Review)". Here is the website link: http://kidminds.org/drinking-gourd-guide-progeny-press-review/. Thank you.